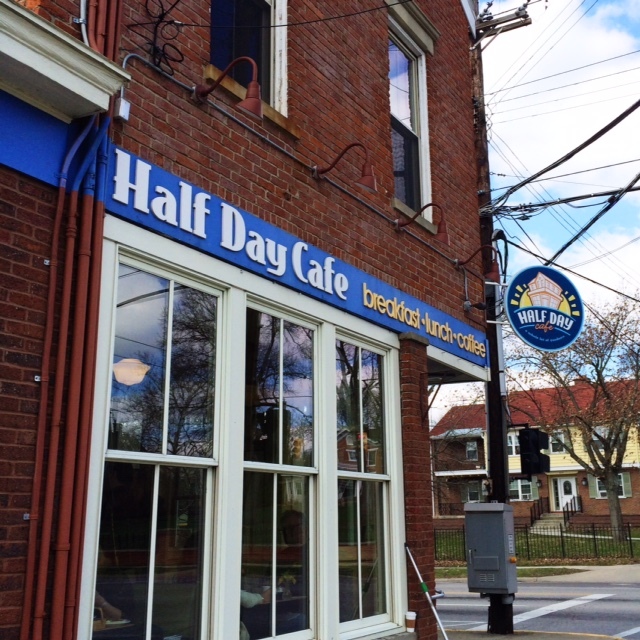 Half Day Cafe – Go There. Try That. 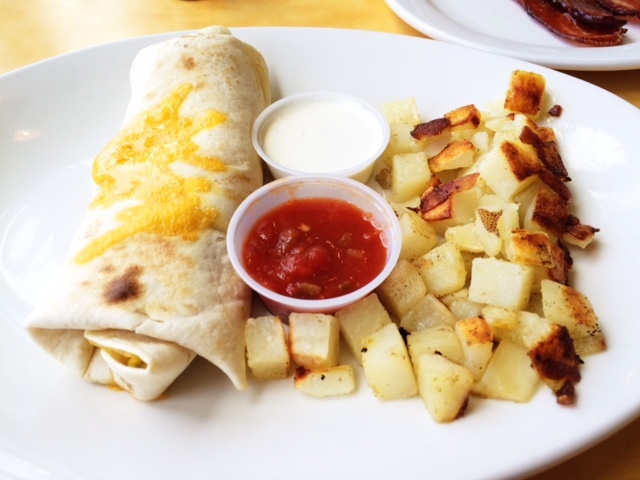 Going out for breakfast on a Saturday morning is one of those experiences that we absolutely love. The best is sleeping in, waking up without an alarm, and just deciding to throw on some clothes and head out! We don’t do it often, but when we do, we’re always looking for a new place. For us, great breakfast includes protein and pancakes. 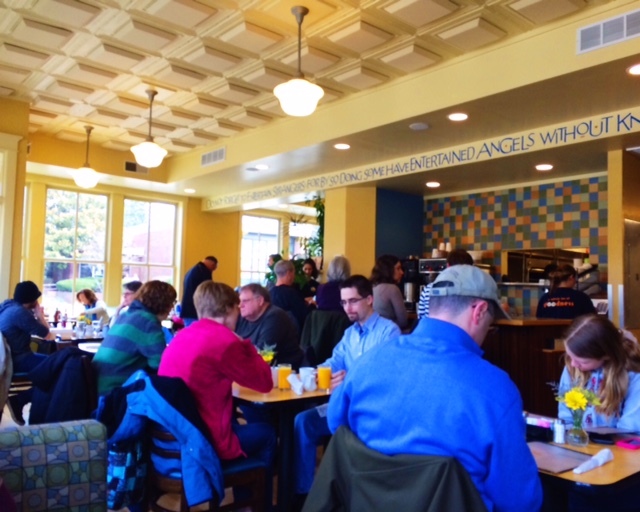 A good breakfast place must do both very well. Half Day Cafe in Wyoming does just that. I’m not sure how we never stumbled upon this place before. It’s a gem in so many ways. For starters, it’s clean and bright! There are big windows providing light for diners, the walls are a sunny yellow, and even though it’s not huge, it feels roomy. On the wall above the counter, there’s an inscription: Do not forget to entertain strangers for by doing so some have entertained angels without knowing it. Yep, my kind of positive place! After talking to our server, who was super friendly, we learned that the owners are a local couple who are passionate about good food and supporting other local businesses. For example, they buy produce from the local farmer’s market, their coffee is purchased from a local coffee roaster, and what they don’t bake in-house is ordered from the neighborhood bakery. I was in love with these people before I even looked at the menu. Some of their most popular breakfast items are the Almond Cinnamon Stuffed French Toast, Sausage Gravy and Biscuits, Mango Butter Rum French Toast, and the Huevos Divorciados (crispy tortillas with eggs, cheddar cheese, black beans, lime crema, and green salsa). They also have regular and specialty pancakes such as the banana chocolate chip pancakes (oh, yeah)! 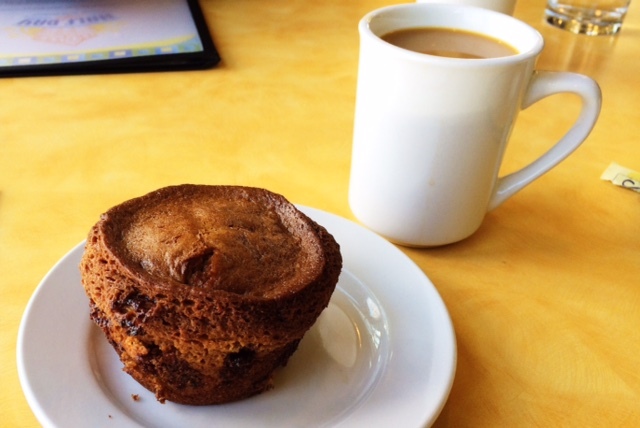 Because I had trouble making up my mind, we started off sharing a freshly baked Espresso Chocolate Chip muffin. A breakfast appetizer is a thing, right? I’ve never had this kind of muffin before, but I definitely would again. It was sweet and savory and warm! 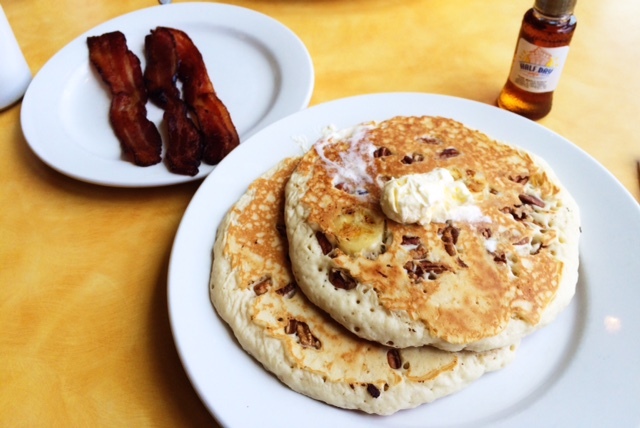 When we finally placed our order, my husbanded ended up with banana pecan pancakes and applewood smoked bacon (not sure why someone picks pecans over chocolate chips, but I still love him). While both were very good, that applewood bacon was the star. It was cut thick, a little bit crispy, and full of flavor. It was almost like bacon candy. Seriously, the best bacon we’ve had in a long time. I tried something a little heartier and went with the Burritos con Carnitas, a breakfast burrito that includes cheese, slow roasted pork, peppers, lime crema, and salsa. Delicious. I could tell the pork was slow cooked and well-seasoned! My meal came with rosemary potatoes and those were fine, but I would probably try the white cheddar grits next time. Half Day Cafe is bright and clean and our service was outstanding! It provided the perfect start to our Saturday adventures. I can’t wait to go back for lunch as well. P.S. This was my first time ordering freshly squeezed orange juice and it was such a nice, refreshing surprise that I ordered a second to go (instead of coffee, which is crazy for me)! 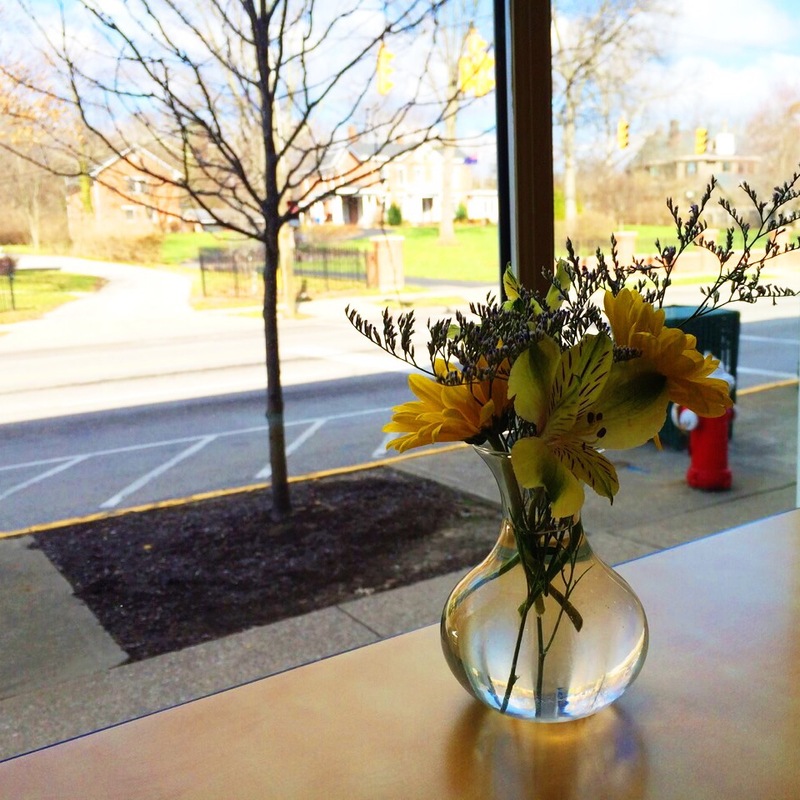 GO THERE (Half Day Cafe)! TRY THAT (applewood bacon)! I’m hungry again, while pancakes are not my morning thing, much of what you mentioned is.